The Twilight Zone‘s “Howling Man” is happy to provide a photo op…for a price. 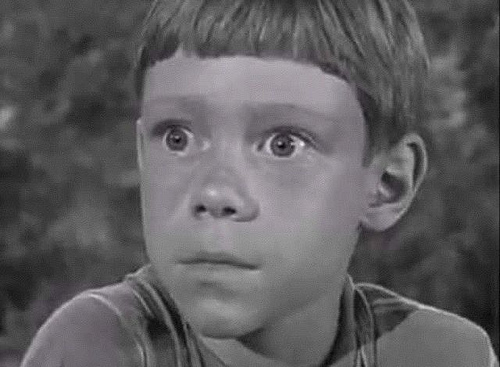 While there were plenty of creepy Twilight Zone episodes, the only one that truly scared me was “It’s a Good Life.” Written by Rod Serling and closely based on Jerome Bixby’s short story of the same name, it posited that the most terrifying thing in the world was a six-year-old child with no moral compass…and absolute power over matter and reality. The story was unusual for The Twilight Zone in that there was no moral lesson, no twist ending, no respite. It ended as it began, with Anthony in charge. It was remade as one segment of 1983’s Twilight Zone feature film. That time, Anthony’s realm was confined to a single house in the countryside. The boy had lured several strangers there to serve as his “family” in an idyllic life (for him, at least) fueled by non-stop cartoons. This version ended hopefully, as a schoolteacher who found herself in Anthony’s world managed to get through to him and promised to help constructively channel his powers. The 2002 revival of the series dared to make a sequel to the original episode, entitled “It’s Still a Good Life.” It reunited Billy Mumy with his TV mom, Cloris Leachman, whose character improbably survived forty years of Anthony’s rule. Anthony Fremont was all grown up. While age had tempered him a bit, he was no less tyrannical for being more self-aware. One had best not beat him at bowling…or lose on purpose. And he had a daughter (played by Mumy’s real-life kid). Yes, little Anthony dipped his wick. You may commence shuddering. The townspeople came to learn that Audrey Fremont was even more powerful than her dad. She could do all the things he could, plus the one thing he couldn’t: bring things back from “the cornfield.” They tried to convince Audrey of the wrongness of her father’s ways, and to use her to end Anthony’s tyrannical reign at last. It didn’t work. And it’s a good thing that it didn’t work. A very good thing. Here’s a fun segment from the ’80s Twilight Zone: “I of Newton,” based on a short story by Joe Haldeman, is about a mathematician (Sherman Hemsley, The Jeffersons) who unwittingly summons a demon (Ron Glass, Firefly) and has to figure out a means of getting rid of him. Glass is especially fun in this, charming and more than a little bit menacing. (Pay attention to his T-shirt.) The writing is snappy and the conclusion is clever. It runs about eight minutes, so you can watch it while enjoying a snack. Might I suggest devil’s food cake? While my family didn’t attend church, that’s not to say that Dad wasn’t interested in the Bible. He’d had an epiphany of sorts when, as an employee of the power company, he’d been caught in a natural gas explosion. He was on a service call when a gas leak ignited and blew up a house. Dad saw its owner consumed by a fireball, and he himself barely escaped. That close call left him looking for God. He sampled a variety of churches and talked to their elders, but was always dissatisfied by the disconnect between their practices and his own interpretation of the Bible. Because of this, I had little formal religious experience in my childhood, outside of one summer at vacation Bible school. Instead, Dad took it upon himself to teach me about God, and in later years even cajoled me into reading portions of the Bible. I didn’t get much out of its arcane prose and archaic grammar, so what I did learn about Christianity came mostly out of our long car trips together. One topic that both fascinated and disturbed me when I was fairly young was that of eternity. Dad said that when people died, they went to Heaven where they lived forever in the presence of God. Superficially, I could see the appeal, but it wasn’t long before I began to think about the ramifications of life eternal. “How long is forever?” I would repeatedly ask him. The question haunted me. How could anything just go on and on and on without end? Even at that young age, it occurred to me that doing anything, however pleasant, for all time was a scary prospect. * There are going to be a lot of Twilight Zone references in this series. Rod Serling had a big impact on me. Even if the afterlife wasn’t likely to be lorded over by a cheerfully sinister Mr. French, it seemed to me that forever was simply too long. I could see myself saying, “Well, this is nice and all, but what else have you got?” Granted, the alternative was equally unpleasant to consider, but we’ll come to that in a later post. Infinity is something I just don’t deal with very well. Whether it’s eternal time or endless space, the concept just gives me the wiggins. In my freshman year of college I took a nighttime astronomy class. For most of the semester we learned about the immediate vicinity of our solar system, but on the final night the professor lectured about what lay beyond: millions of stars in our galaxy, thousands of galaxies and unimaginable spaces between them. It might not go on forever, but it was close enough. When I walked back to the dorm that evening, it was a starry night. And as I looked up, for the first time I felt aware of how absurdly tiny I was, and how little separated me from darkness without end. The sky was too open; it offered too little protection. There was far, far more nothing than there was anything. There are many who look at the seemingly infinite majesty of the universe and see the face of God, but instead I am reminded that I that I exist as a tiny, brief-lived blob of matter clinging to a slightly larger (on the cosmological scale) blob, with vast chasms of time and space surrounding me in all directions. It’s not a comforting thought. One of the reasons I’m most grateful for the TV-on-DVD format hit retail last week: the 1985 version of The Twilight Zone. Viewers of a certain age may recall that for a brief time, there were three drama anthologies on network TV in 1985. The one with the highest profile was Steven Spielberg’s Amazing Stories, which NBC contracted for an unprecedented two-year run before the first episode ever aired. Second was a remake of Alfred Hitchcock Presents, featuring colorized versions of the old Hitchcock intro segments. Third was The Twilight Zone, which for me turned out to be the most interesting and well-produced of the lot. Producer Philip DeGuere (who was also behind another of my favorite series, Max Headroom) took a very different approach to updating the classic Rod Serling fantasy. Rather than a single, half-hour episode, he used a flexible hour format with two or three tales of varying lengths. In that manner, some stories could be developed fully, while others (particularly those entirely dependent on a twist ending) could get on and off the stage without unnecessarily stretching the gag. The results were mixed, but the same could be said of the original Zone. Even a brilliant writer like Serling was entirely capable of penning a lousy episode or three. However, there were a number of stories that were entirely worthy of the Twilight Zone name, and others which arguably improved upon the formula, notably the love story Her Pilgrim Soul. One appealing aspect of the ’85 series (as had been the case with the original) was its frequent use of sci-fi and fantasy short stories by known authors. Harlan Ellison (who also served as a creative consultant before an inevitable tiff over one of his shows caused him to leave) contributed several scripts, and Ray Bradbury wrote an episode (The Elevator) as well. 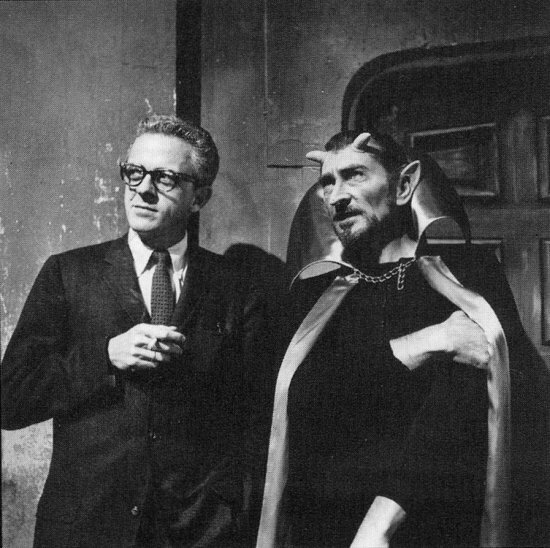 Stories by Henry Slesar (Examination Day), Joe Haldeman (I of Newton), Arthur C. Clarke (The Star) and Roger Zelazny (The Last Defender of Camelot) were among those seen during its brief, two-season CBS run. A Little Peace and Quiet. Melinda Dillon plays a harried housewife who is grateful for the peace offered by an amulet that can stop time. A Message from Charity. A young boy inexplicably finds himself in telepathic contact with a girl in Puritan New England, and must save her from being branded a witch. Her Pilgrim Soul. A scientist falls in love with a living hologram who matures from fetushood to old age in a matter of days. I of Newton. Sherman Hemsley is a mathematician who accidentally sells his soul to a devil, and engages in a battle of wits. The Misfortune Cookie. A critic gets his just desserts after unfairly maligning a Chinese restaurant. A Small Talent for War. An alien arrives to tell humanity that he is disappointed with their warlike ways, and gives them 24 hours to change or face destruction. A Matter of Minutes. A married couple find themselves outside of time, and encounter the construction crew responsible for building each individual second. To See the Invisible Man. For the crime of being emotionally cold, a man is sentenced to “invisibility”: everyone he meets is required to ignore him. Dead Run. A truck driver is hired to carry souls to Hell. I am amazed that this episode ever got to air on network TV, given its suggestion that God has contracted the Religious Right to determine whom is allowed into Heaven. Button, Button. A couple will be given $200,000 for the simple act of pushing a mysterious button, which they are told will kill a person they do not know. The Once and Future King. An Elvis impersonator travels in time and meets the King at the start of his career. The Toys of Caliban. Parents are faced with the impossible task of raising a retarded child with the ability to “bring” any object he sees pictured. Shelter Skelter. A survivalist is entombed in his shelter when a nuclear blast obliterates the town above him. The ’85 Zone may not be as well-remembered or regarded as the original, but there are gems within for those who take the journey.